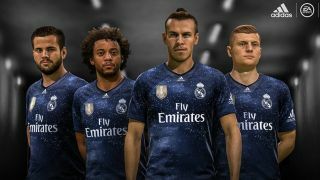 Big-club kits can go for serious coin in FIFA 19 Ultimate Team – so keep your eyes peeled in packs over the Christmas period, as EA has just announced four new official in-game strips for Manchester United, Bayern Munich, Real Madrid and Juventus. What's special about these is that, thanks to a tie-in with strip manufacturer Adidas, all are effectively fourth kits for bona fide super clubs made specifically for FIFA 19. Unlike last year, however, you'll also be able to pick them up in real life – albeit at a hefty cost, with the United one setting you back £65. All of the kits are pictured here, and there are three ways you can get them. If you had Bayern, United, Real or Juve as your favourite club in-game prior to 28 November, you'll receive that team's respective kit next time you log into FIFA 19. Note that Nintendo Switch users will have to wait until 14 December for it to materialise. From Friday 30 November, it'll also be possible to unlock each of the kits by completing weekly objectives. These will go live at 6pm UK time. If that sounds like too much hard work, you can chance your arm at finding them in packs, or on the transfer market, from 14 December onwards. For more info on mastering these methods be sure to check out GR's FIFA 19 Web App guide. FIFA 19 is out now. More interested in where to play than what to wear? Then you need GR's guide to the best FIFA 19 stadiums for Ultimate Team.